A small bathtub is a nice alternative to a regular one and not only because it’d free up more space in the bathroom. 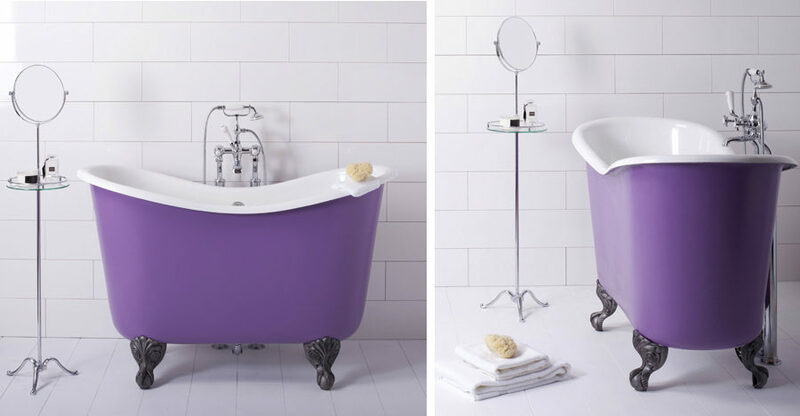 These amazing soaking freestanding tubs are made for relaxation and, well, soaking. Besides you can easily turn one into a shower and use the rest of that bathroom space for washers, storage, or simply to create an airy look in an already cramped room. Small bathtubs come in all shapes and different sizes. They aren’t just circular or oval. 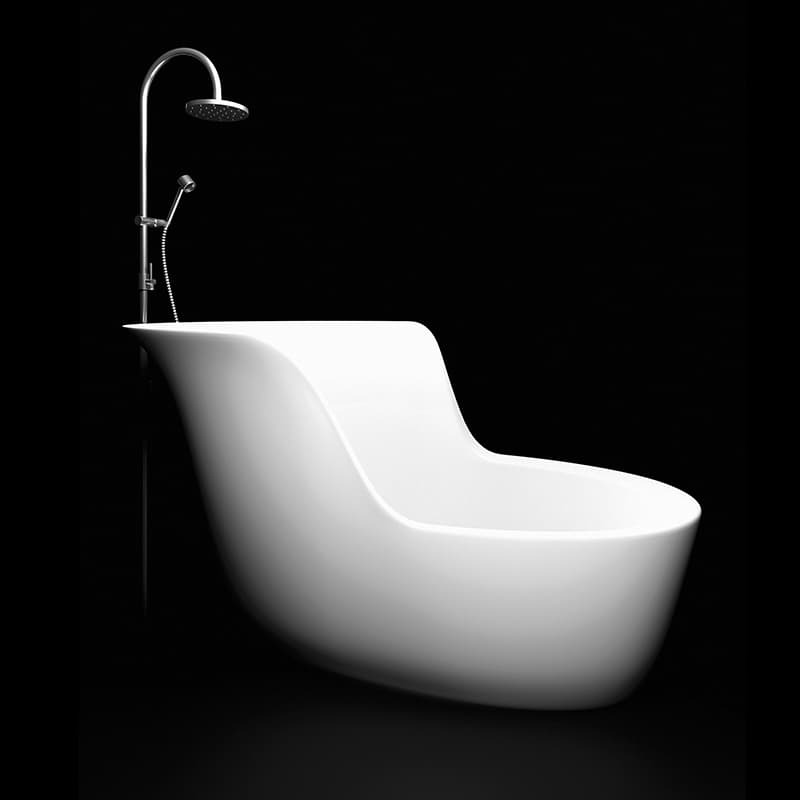 There are classical claw feet freestanding tubs in minimized versions, square tubs and all kinds of forms in between. 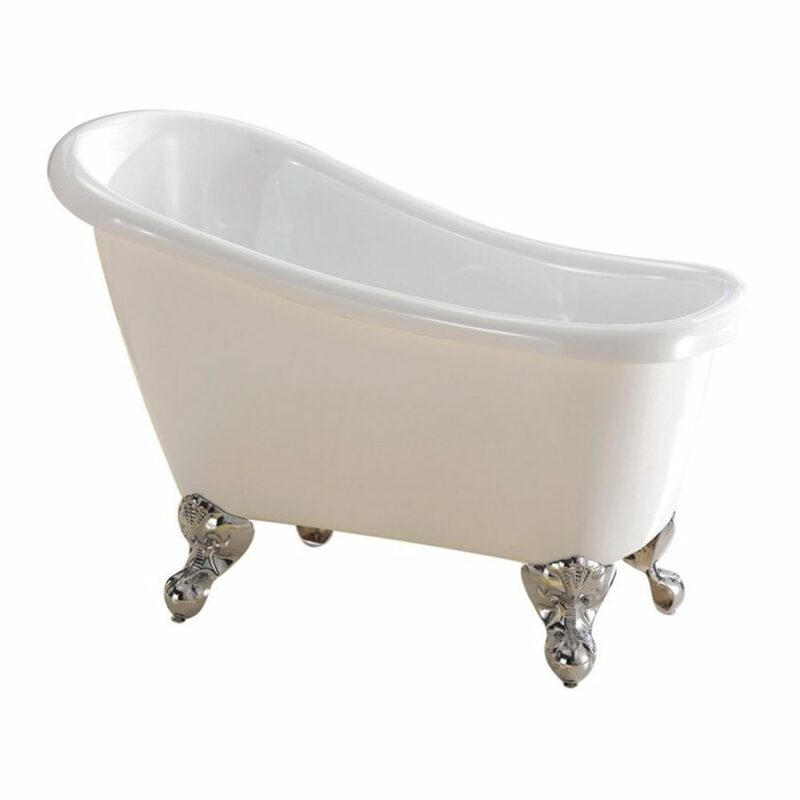 This Barclay‘s Cyrano Acrylic Slipper tub is just 44″ with the beautiful brushed nickel imperial feet and a roll top. It goes to show that even if your bathroom is tiny you can still create a vintage style interior with a classic tub that won’t take up too much space. It is ideal for the bedroom too because you won’t end up giving too much of the floor space to the bathroom area. Even though tiny it still has the presence that people like so much about the clawfoot tubs. Circular shape is probably the most popular among the soaking tubs but this Marmorin Jena shoe-shaped design is all about ergonomics. It may look bigger than it really is but it’s all because of its high back that allows to really lean back and enjoy your me-time. This form is getting more widespread but it surely requires a bit more space. Well, at least you can sit back and hide from the world behind those tall tub walls. Material is as important as the shape of a tub. Copper is a huge design trend right now and the bathtubs that are made of it can surely add some style points to a modern bathroom. 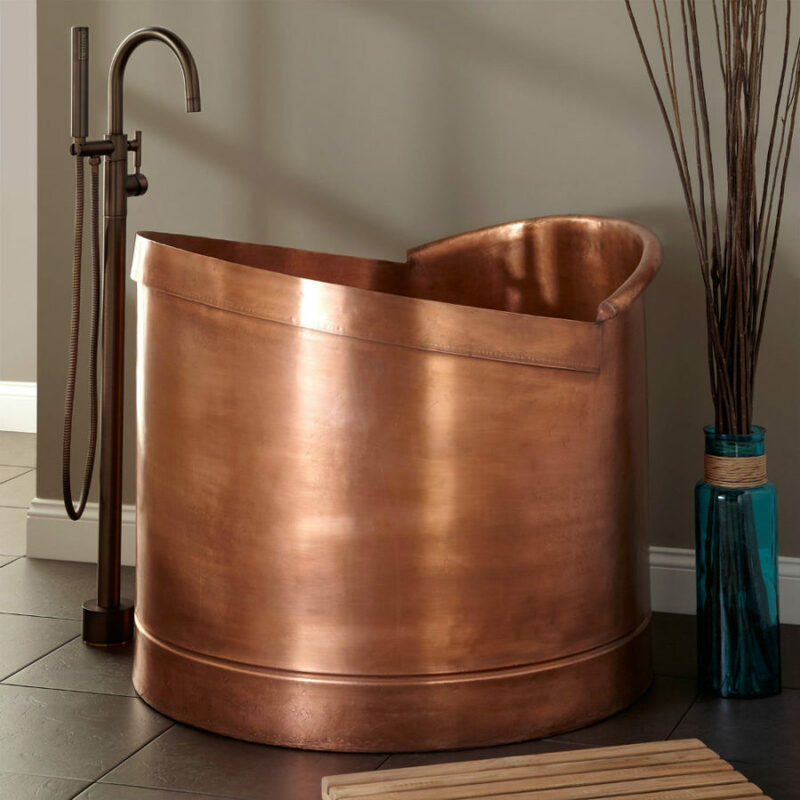 This 39″ Asti Copper Japanese Soaking Tub from Signature Hardware has an amazing albeit simple design and can probably fit into the tiniest of bathrooms. Copper is not only quite easy to clean and maintain, it is also antibacterial. It looks well as it ages and if you choose really carefully it will serve you for quite a long time. Decor tip: match copper with teal or turquoise accents for a truly stunning look. 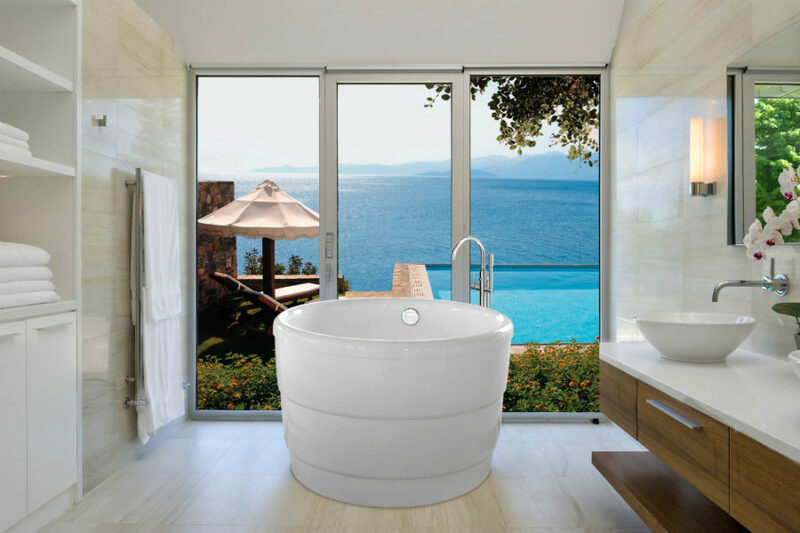 Like it or not the round shape is simply the most efficient when it comes to small bathtubs. 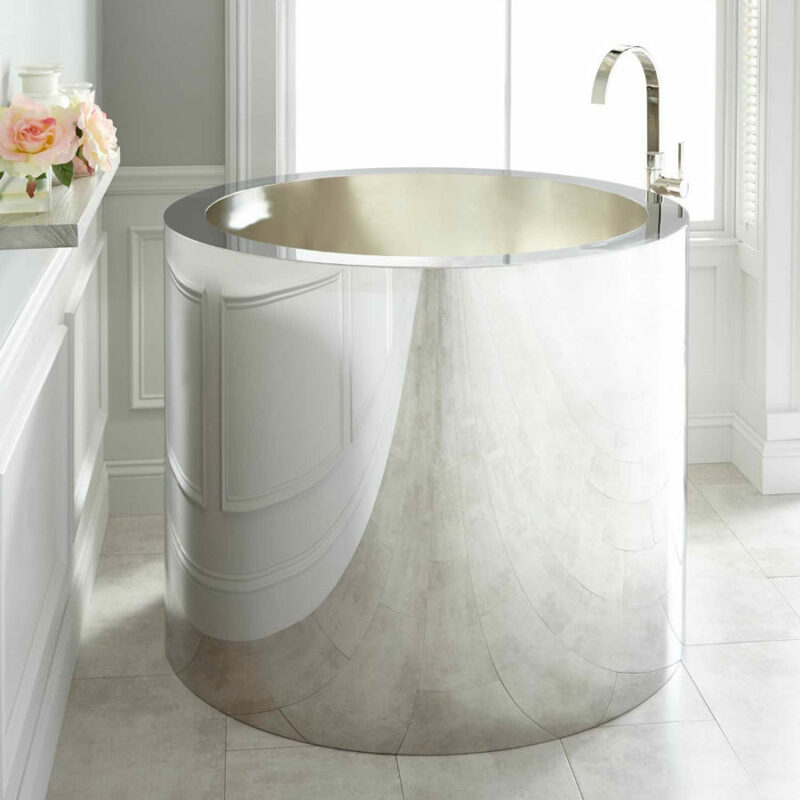 This is another one of Signature Hardware‘s mini tubs, a 43″ Simone Polished Stainless Steel Soaking Tub, stylish and very small. 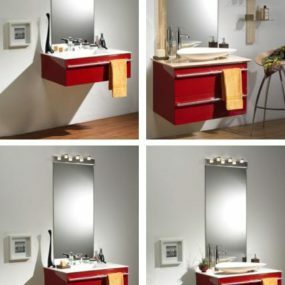 It would surely fit into any small bathroom and make it look amazing. The modern stainless steel finish can go well with both traditional and ultra modern or minimalist decorating styles. It all depends on what you’re going for. 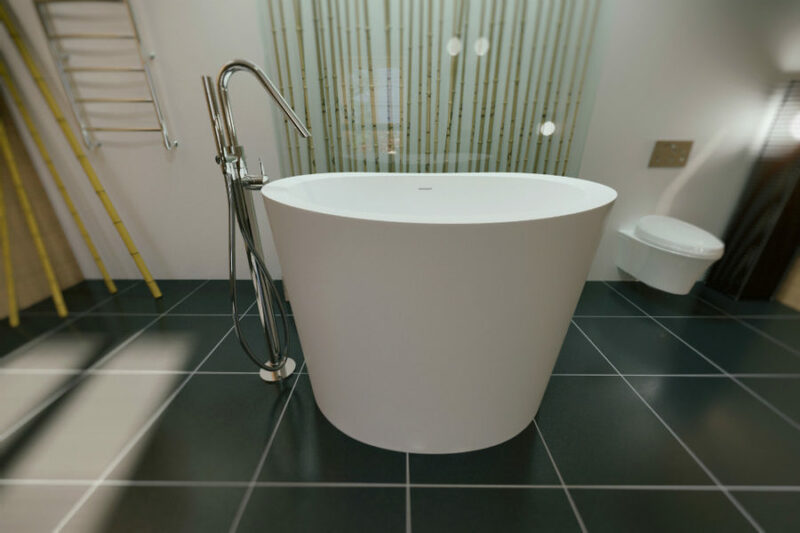 Of course, if a square tub works better for your floor plan then you’re in luck because there are quite a lot of them on the market right now. For instance, this ADM Bathroom Design square tub is a perfect fit for a small bathroom, especially if you’re planning to tuck it into a corner. Some square tubs feature a circle carved up inside of them leaving some space around the angles for storing small things like shampoos and soaps. Some even feature a mini deck with steps to make it easier to get in. Speaking of tall and small bathtubs, going upwards is always a valid way to economically use space regardless of the room. In a small bathroom a tall soaking tub leaves so much free space to simply move around. 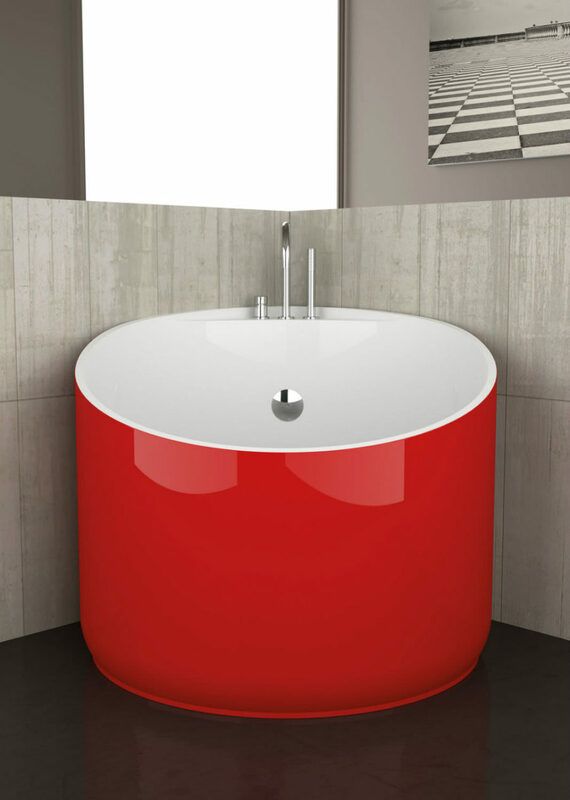 Circular soaking tubs can often be quite deep and tall like the Aquatica‘s TrueOfuro freestanding tub. It is quite small but a grown adult can clearly fit in it without any problem. Purescape tub from Aquatica is designed by the same principle but it has a modern look to it. It also features the decorative rings that make it look like a collapsable cup. 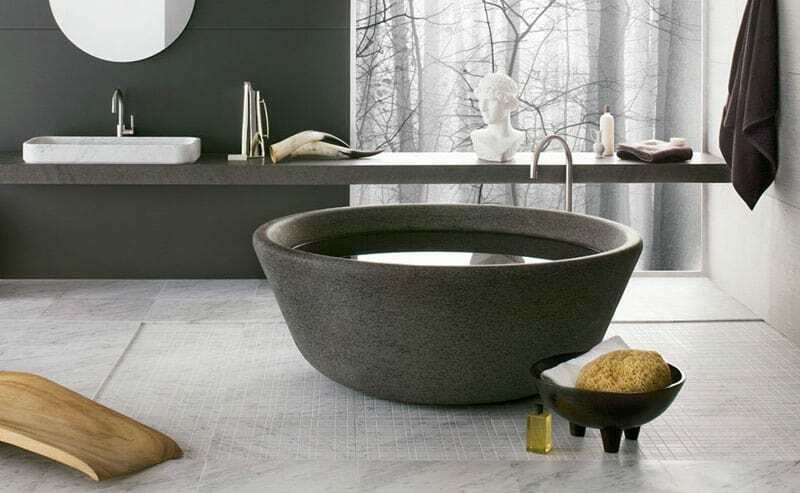 Speaking of which, soaking tubs often have cup-like shapes but there are other small tub designs that resemble things like bowls and even vases. While round tubs look more impressive in the middle of the room or beside a bed or a window, they can also quite successfully fit into a corner. This Glass Design acrylic mini tub has its back raised and while it’s circular there’s little space wasted between it and the wall. Beside shapes, sizes and materials the color of a bathtub is a whole different factor that diversifies the choice. Surely most of them are still white on the inside but the sides come in all the different colors from red to blue to golden. 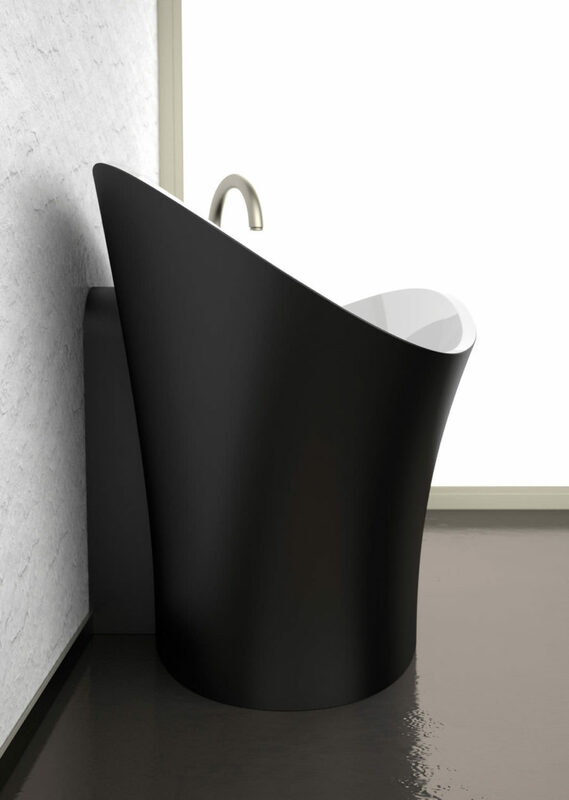 Another great small bathtub design from Glass Design looks more like a flower vase (perhaps hence the name) and features a black exterior but the white insides. Sure, it may not look as convenient or practical but just look at how little floor space it occupies. You can probably stand upright inside of it, which would eliminate the need for a shower. But the question is how does one get in? 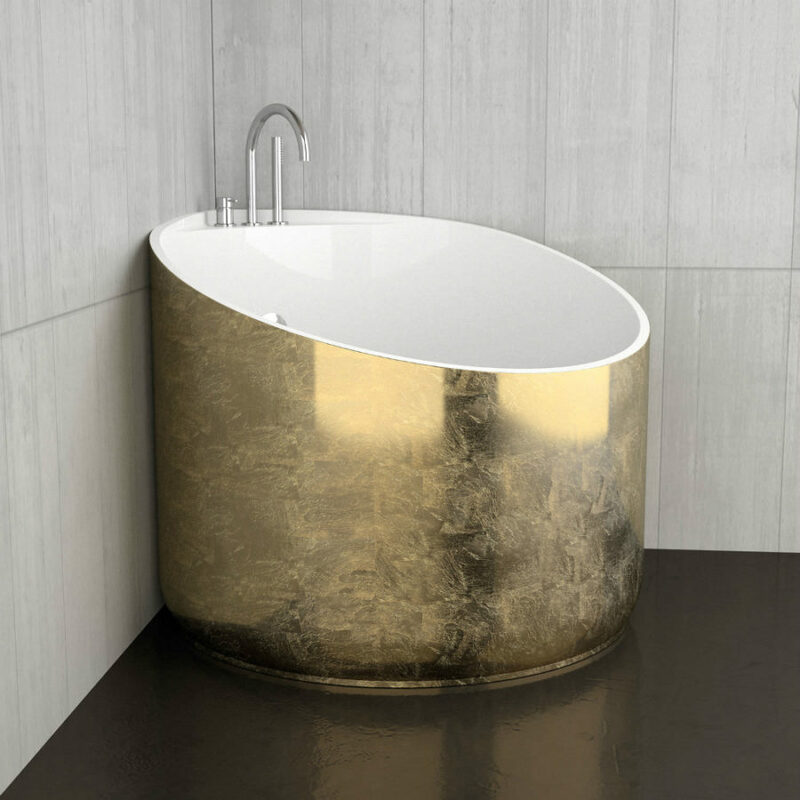 Their Mini Gold Leaf small bathtub can really transform a tiny bathroom. Its beautiful finish would definitely make for a luxury bath interior. Since its back is raised and a bit pointed, it too fits well into the corner. Although who would want to tuck it in there rather than placing it right in the middle of the room? Freestanding bathtubs are very popular right now. But if you need a mini version that would fit into a tiny bathroom the Tubby Torre from Albion Bath Co. is a perfect option. 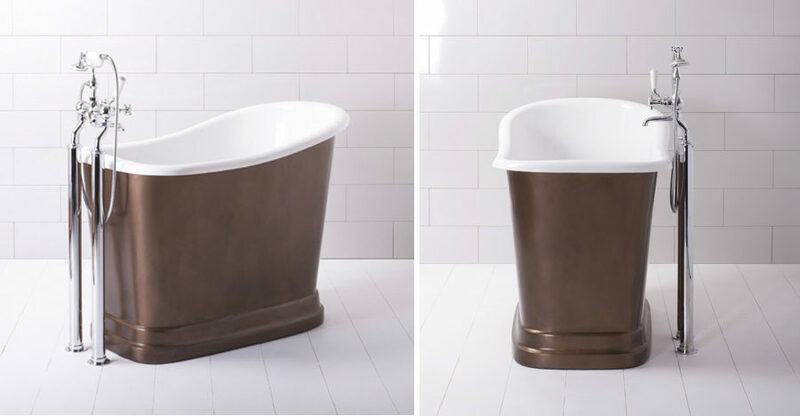 Painted into a beautiful dark bronze the bathtub would make a gorgeous addition to any bathroom or even bedroom. It’s compact enough to leave a lot of free space in the room. 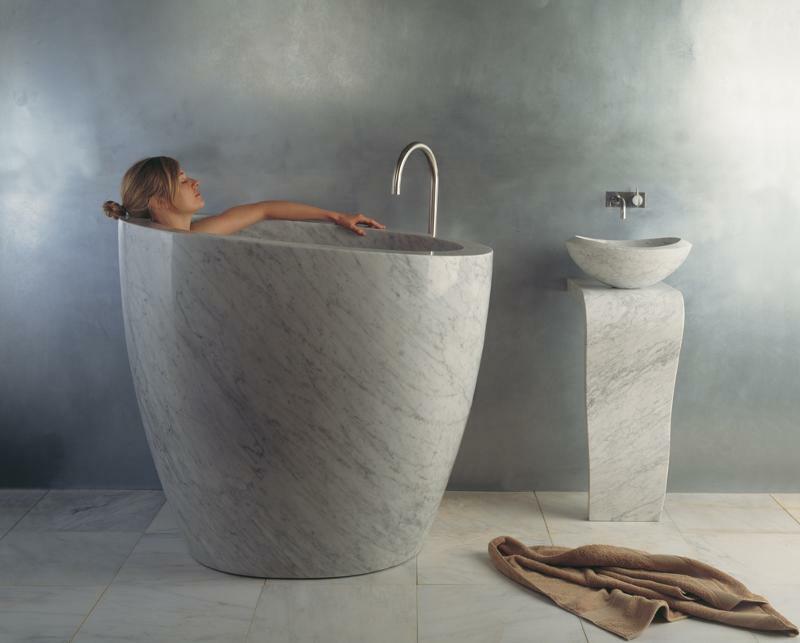 And it’s beautiful enough to pass as a full-sized luxury freestanding tub. Tubby Too Short is another contender for a small luxury bathroom. 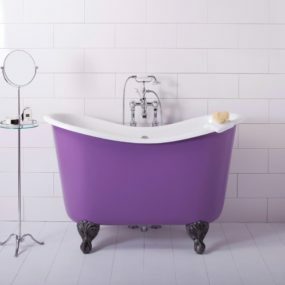 This mini clawfoot tub painted into bright purple really calls for a mock vintage style or maybe even shabby chic. It is a great way to add a pop of color to a small bathroom. 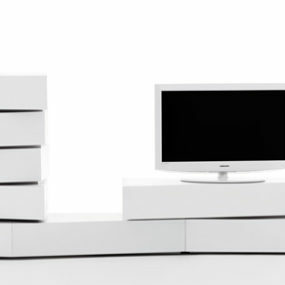 It both creates a focal point in the interior and requires no additional decorative accents. 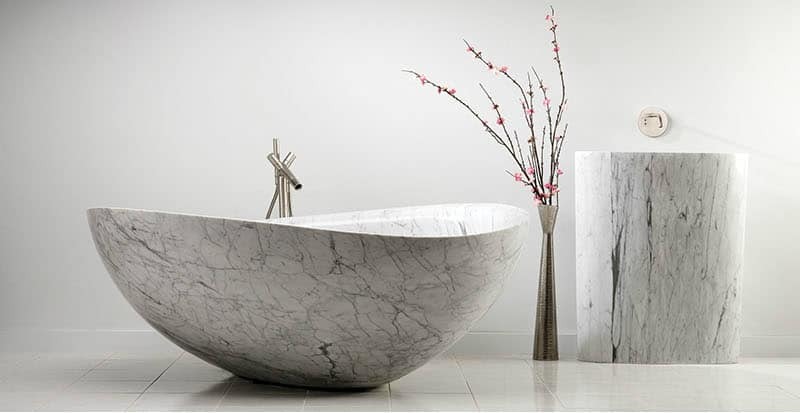 Though stone isn’t accessible to most, the bathtubs made out of it can look truly incredible. Even the small ones. Stone Forest shows what marble sandstone can do to such a mundane thing as a bathtub. Beside the high cost natural stone requires tremendous maintenance. So if you think you want one be sure to do your homework and find out what you’re getting into before the purchase. Stone Forest knows a thing or two about impressive stonework. 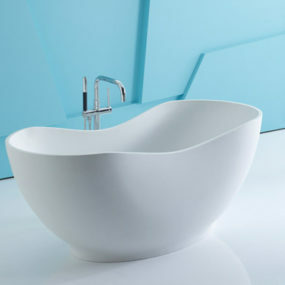 This small bathtub was presented at ICFF and also at IDS12. It earned a 2011 BOY Merit Award from Interior Design Magazine and general media attention for its impeccable design. Finished with a sealant (like this one), stone bathtubs require careful cleaning. If the sealant is damaged your tub could end up with stains and scratches. But even with sealant intact you still want to wipe it dry after each use. This is done to prevent mineral and soap scum buildup. Do you think you’re ready for such a commitment? 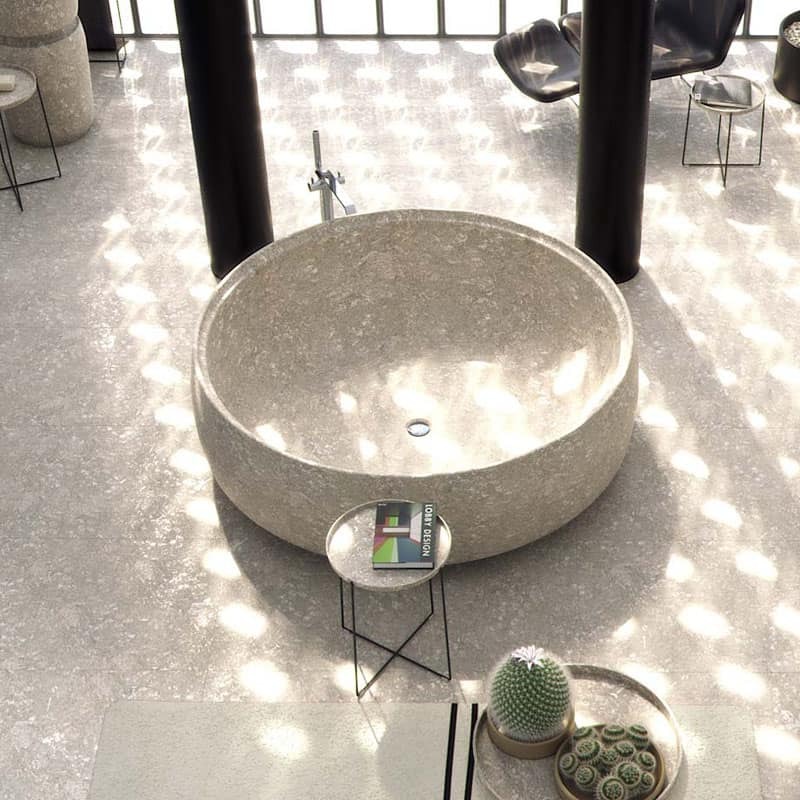 The GRAL bathtub by SIGN looks like an oversized sink and while small it’s definitely a luxury tub as it was made out of a single excavated stone piece. 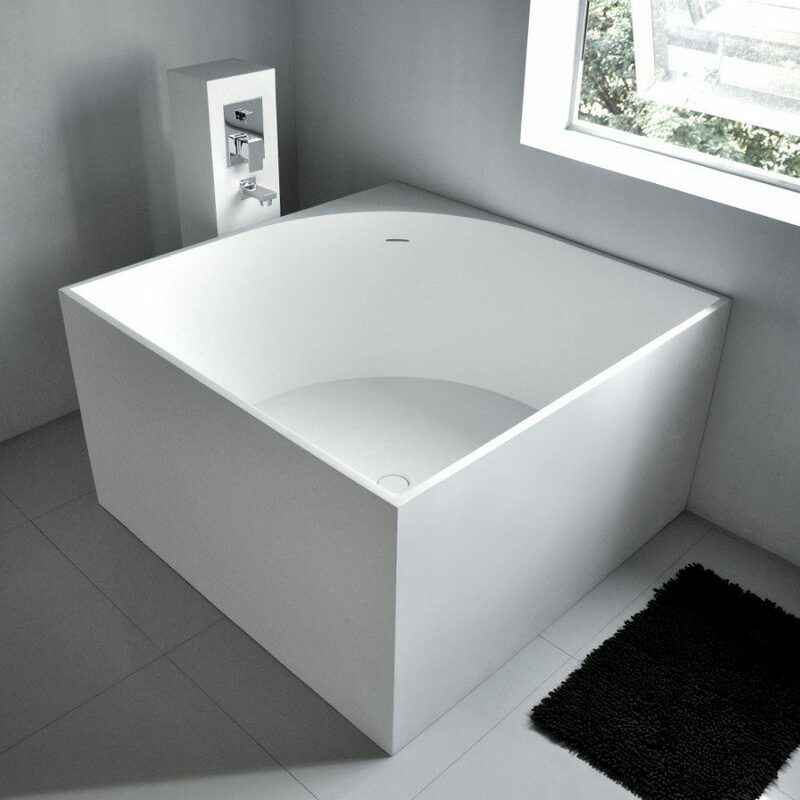 If you’re trying to save both space and money though you can surely find an equivalent shape among more modest modern tubs on the market. As we already mentioned, a small bathtub doesn’t have to only be a solution to the lack of space. In a spacious bathroom it can simply allow you to add features that aren’t fit for the other rooms. This beautiful stone bath is doing just that in a house designed by Carver + Schicketanz. There’s plenty of space in the indoor/outdoor room with some serious furnishings that offer plenty of storage space. SPA bathtubs are definitely the ones that allow you to soak well and relax. This one was designed by nespoli e novara for Neutra Design and it surely looks relaxing. Available in a range of various stones including moonstone and granite it makes for a luxury addition to a small bathroom. While you may think it’s not as versatile a small bathtub can double as a shower or even a whirl tub. So even those who lack space can enjoy a piece of their favorite SPA right at home. 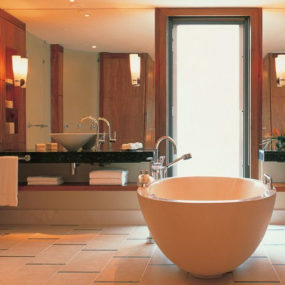 Think small bathtubs can’t look impressive? Then you didn’t see this bathroom designed by JAUREGUI Architecture Interiors Construction. 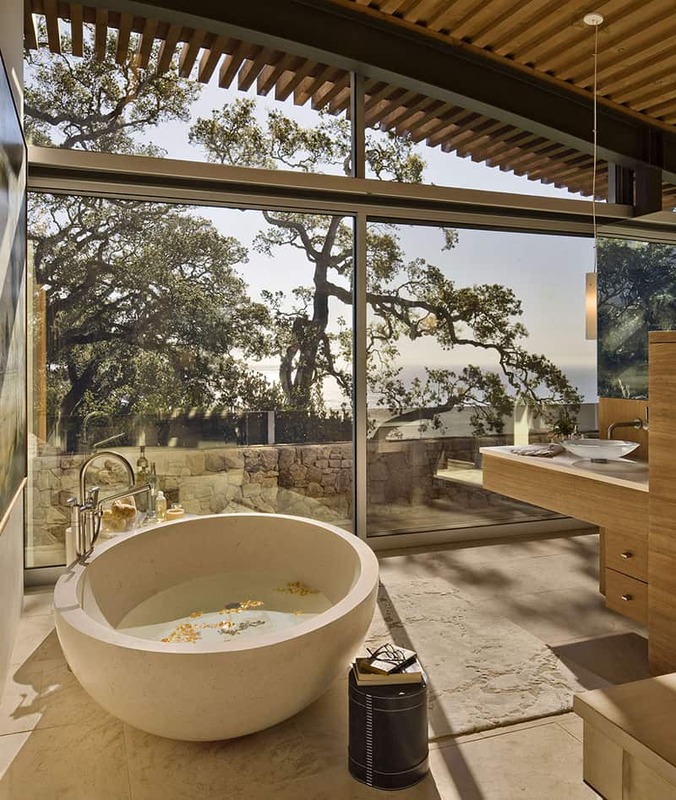 Featuring a built-in round bathtub with a marble ring and a waterfall tap this interior is out of this world. Of course, the glazed walls and a marble fireplace add considerably to the interior design. 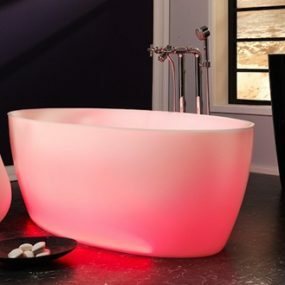 But you can’t deny that you’ve never seen a tub like this one before. 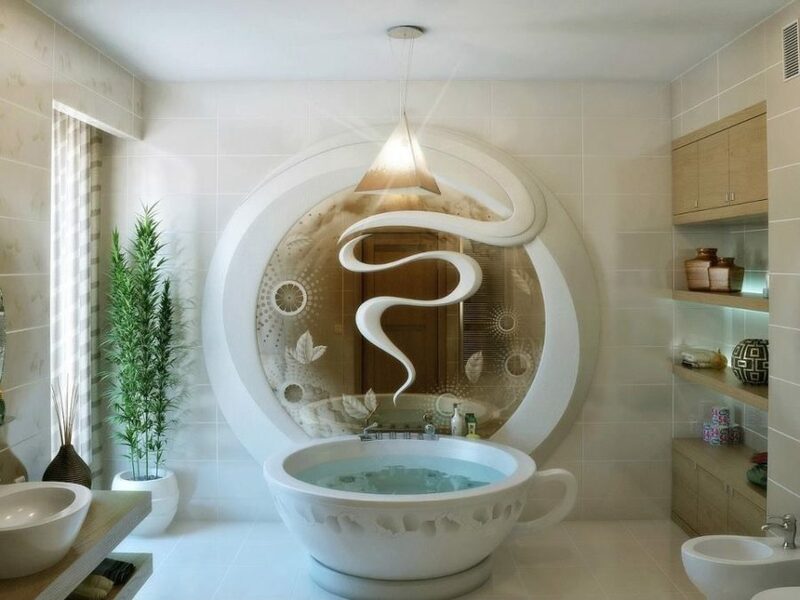 Another bathtub you may have never seen before is this coffee cup-shaped bathtub complemented with a themed feature wall. It’s cute but nevertheless impressive. A cleverly incorporated mirror makes the small room feel more spacious. And still there’s plenty of space for storage, toilet, bidet and a sink with a vanity. What an incredible idea and execution! 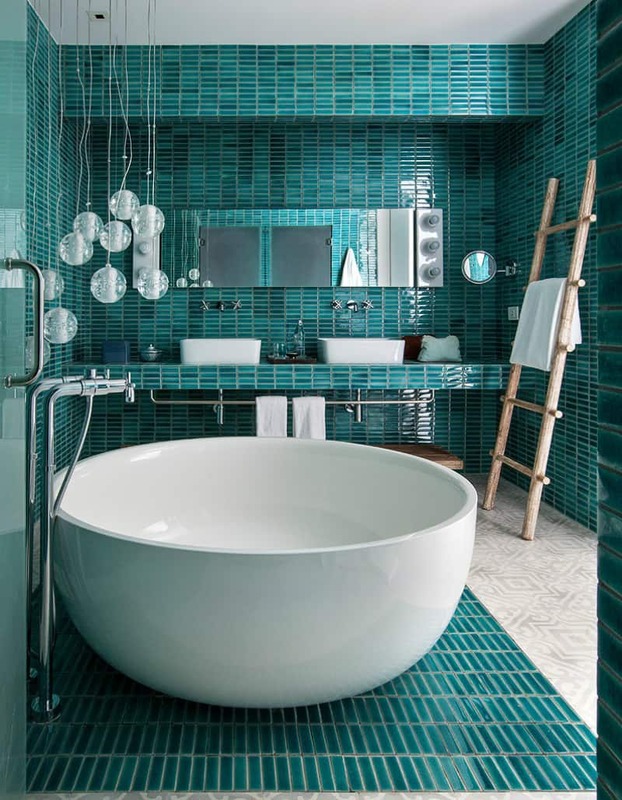 As you can see even a simple small bathtub can look impressive when it’s a bowl-shaped freestanding design accented with bright teal tiles as a backdrop for a pristine white vessel. Bubble pendant lights play into the picture full of circular shapes. And a wooden ladder that may look a bit out of place adds its own charm to the look. 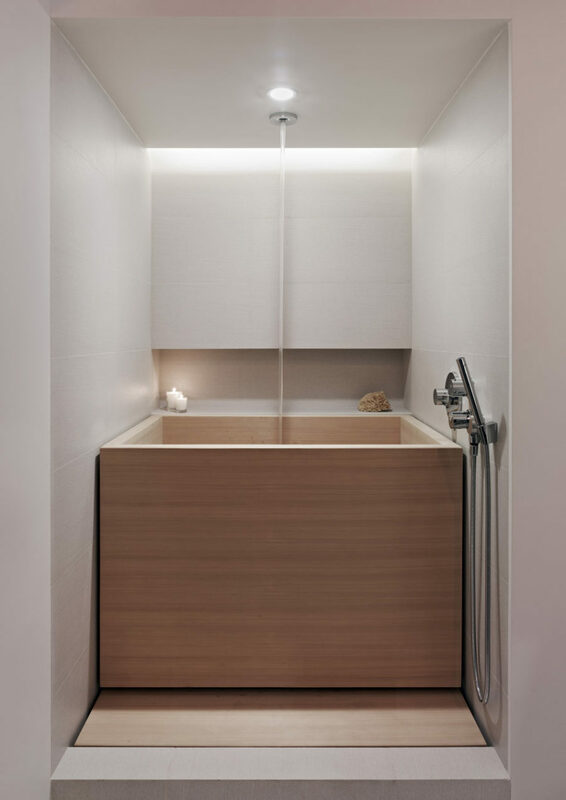 This is a great example of how you can combine the bedroom and bathroom by Finnis Architects. A small bathtub doesn’t get in the way and a half wall gives it a bit of privacy. There are quite a few challenges when it comes to moving a bathtub into the bedroom but in the end of the day the look is definitely worth it. A small bathtub doesn’t have to be freestanding of course. If you need or want to build it into the floor or between the walls you can do that especially in a particularly tight room. 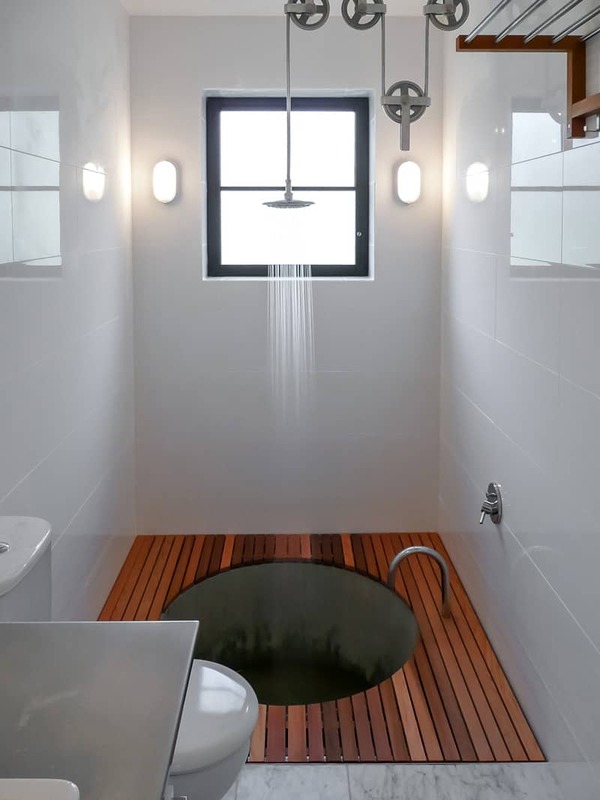 This pulley shower system by Lance Workshop features a sunken concrete bathtub that can easily provide residents with both quick morning showers and the prolonged relaxing bathing sessions. 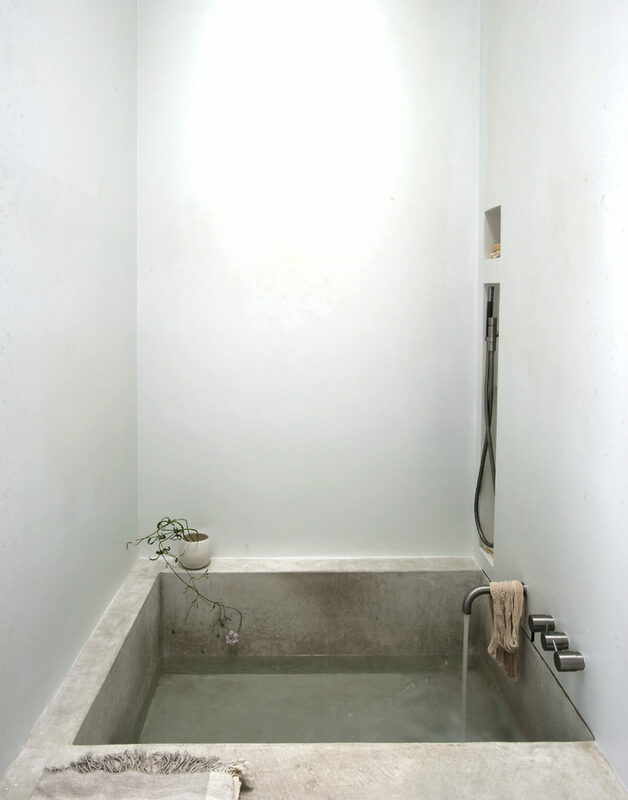 In Michaela Scherrer‘s Pasadena bungalow the concrete SPA bathtub features a partially hidden shower and thick enough borders to keep the appropriate toiletries within a hand’s reach. As you can see you don’t need a fancy tub or tiles to create your own SPA bath. The white plastered walls and grey concrete work quite nicely together making for a very modern minimal look. Wood is another material on the rise in the bathtub design. Wooden tubs like this one in the Oriental Warehouse are too high-maintenance but they provide the bathroom with an unparalleled look and feel. Since they too feature a sealant, cleaning and maintenance should be directed at keeping it intact so the water wouldn’t harm the wood. A small bathtub is not only space-efficient but can also help to create an amazing bathroom interior design. Besides it can also double as a shower or a hot tub. It can look impressive especially if made out of stone and the downsized traditional versions can allow you to have a vintage or traditional look without requiring much space. 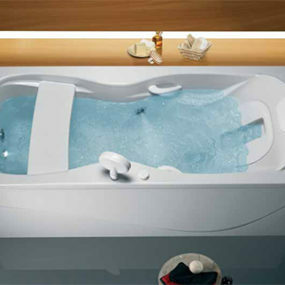 New Tall Soaking Tub from Stone Forest – enjoy deep relaxation!